Writers have always stolen things: stories, language, anecdotes, ideas. The writer of the gospel of John stole his opening lines from the writers of the book of Genesis. And they, in turn, probably stole from some Babylonians. Nobody knows who the original stealer was, but perhaps all writers are stealing words overheard from the mouth of God in Creation. Contemporary poets, too, steal from texts. Ted Hughes, in the midst of his own hell, refashioned Eden but inserted a new character: a particularly malevolent Crow. Marie Howe brings Mary Magdalene to today, crossing a street, trying to decide whether to watch another episode on Netflix. This workshop will examine contemporary poets who use biblical land, literature, and language, and consider how these poets are theologians whose insights can reshape our reading of the biblical text as preachers. The poems we’ll explore are not for prettying up your preaching; they’re for undoing it. Scripture itself tells us “the Word of God is alive and active.” In this workshop we will explore how poetry gives us new ears to hear the Bible’s growling, its desperate breaths, its shouting, its pleading for a different way of living. We will explore up to four poems every day in class, considering the artistry of the poet and considering how the poet’s reshaping of a biblical narrative interrupts received readings of that text. Every class will also involve a prompt for your own writing (poetry, sermons, essay), with the final class being dedicated to hearing some of what you’ve been working on during the week. This class is particularly aimed at clergy and teachers of biblical literature or religious studies. Participants will be asked to make a close study of some biblical texts in preparation for the class. 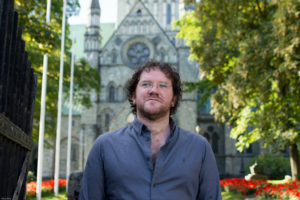 Pádraig Ó Tuama is a poet and theologian based in Belfast. Pádraig’s interests encompass poetry, religion, conflict, and storytelling. His poetry and theological essays receive critical acclaim from circles engaged with poetry, psychology, and religion. No stranger to the underbelly of the world, Pádraig has worked in conflict resolution for much of the past twenty years. Since 2014 he has been the leader of the Corrymeela Community, Ireland’s oldest peace and reconciliation organization; dedicated to “transforming conflict through human encounter.” A recurring guest on Krista Tippett’s On Being, Pádraig’s words bring art and theology together in a compelling experience.